Former Nigeria captain Daniel Amokachi has quit as manager of Nigerian top-flight side FC IfeanyiUbah only five weeks after he was appointed. The 42-year-old had spoken about his desire to win titles and take the big-spending club to the next level. But a string of poor results and irreconcilable differences with the owner has led to his exit. 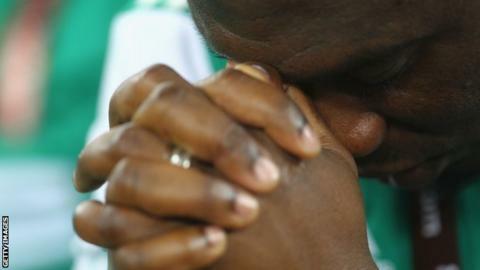 "I'm disappointed at leaving after only a short spell but football goes on," Amokachi told BBC Sport. "I have always been a fan of the club before my appointment as a manager because of the idea behind its foundation. "But right now I wish the club all the best moving forward and I will follow their progress with great pride." Reports suggested Amokachi was unhappy with the club's policy of making the team travel back from away matches at night using dangerous roads to return to their base in south-eastern Nigeria. His stance put him at odds with the club's multi-millionaire owner, Ifeanyi Ubah, with the businessman understood to feel Amokachi's protest were an act of insubordination. Amokachi refused to comment when asked about the issue. "Football life is unpredictable and there is no point going back and forth," he said. "It has been an honour to be involved with the club but right now it is over for me at FC IfeanyiUbah."